Cesarean section rates in Lithuania using Robson Ten Group Classification System. Factors associated with bone mineral density loss in patients with spondyloarthropathies: A 4-year follow-up study. Spinal posture in different DanceSport dance styles compared with track and field athletes. 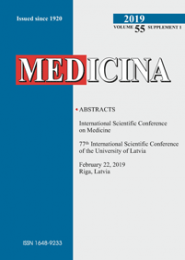 Treatment procedures and referral patterns of general dentists in Lithuania.